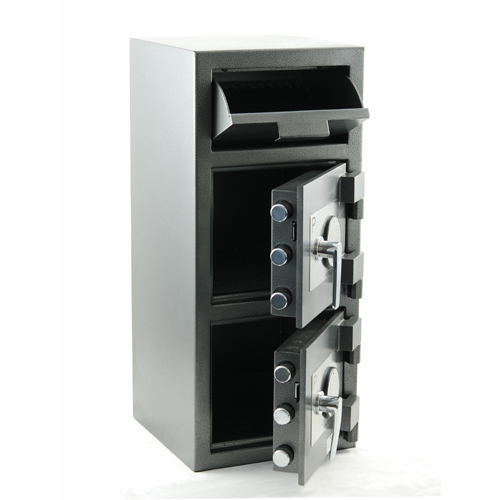 This dual compartment depository safe is taller and narrower than the FDD-3020. At about the same width as a vertical filing cabinet, the FDD-3214 can fit into narrow spaces in a file room accounting office. One compartment accepts deposits, while the other compartment holds coins, cash, or valuables for withdrawal. The FDD-3214 offers an excellent option for any business or organization that needs to hold a collection of deposited cash, checks, and valuables while also securing operating cash (such as hotels, bars, restaurants, gas stations, and convenience stores). Please call to confirm orders of more than five of these safes at one time.